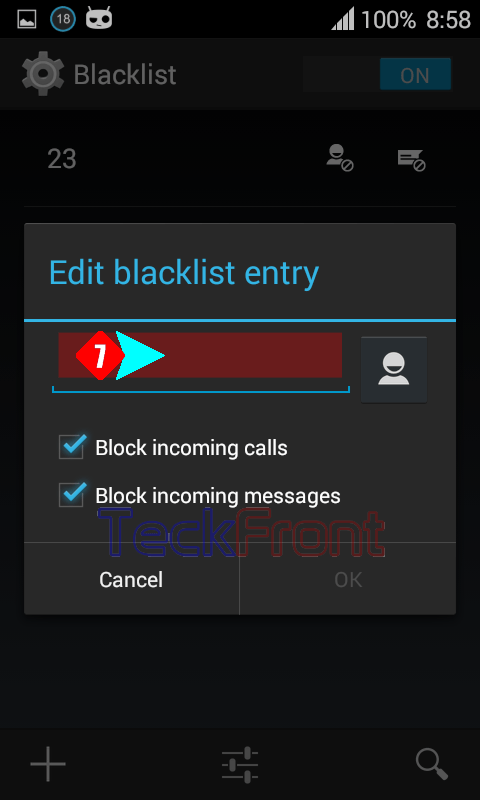 How to Add Contacts to Blacklist Messages in Android 4.4.4 KitKat Phone? 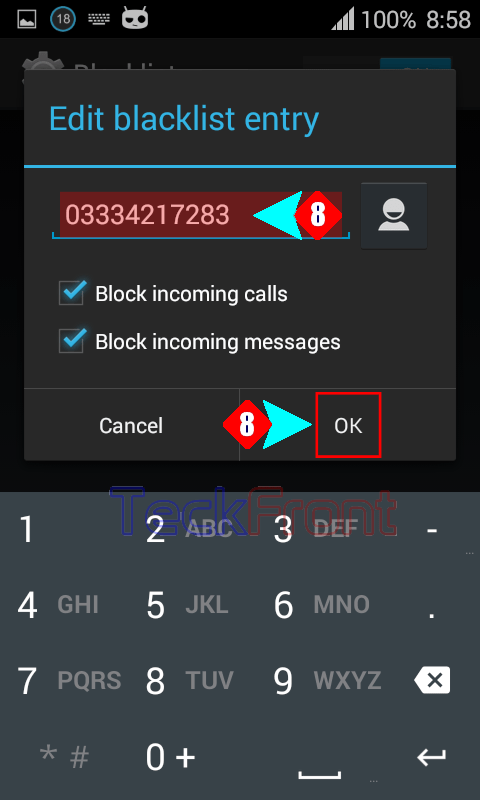 Blocking annoying messages procedure is made simpler in Android 4.4.4 KitKat phones. You may add contact numbers to block messages from these numbers by blacklisting the phone contacts. This is simple if the the instructions are followed. Command Line: Messaging App > Settings Menu > Settings > Blacklist – EXTRA SETTINGS > ADD NUMBER > Edit black entry. 1: Tap the ‘Messaging’ app to open up the Messaging screen of the Android 4.4.4 KitKat phone. 2: Tap the ‘Settings menu’ to open up a popup menu. 3: Tap the ‘Settings’ in the popup menu. 4: See the status of the ‘Blacklist’. It is; ‘Incoming messages from phone numbers in the blacklist will be blocked’. Tap the ‘Blacklist’ under the EXTRA SETTINGS and it will open up the ‘Blacklist’ screen. 5: At the ‘Blacklist’ screen, see the switch is ON, i.e. the ‘Blacklist’ feature is activated and enabled. 6: Tap the ‘+’ to add the contacts numbers. It will open up a prompt named; ‘Edit blacklist entry’. 7: To add the contact number in the blacklist, tap at the place for the contact entry. It will open up a keyboard under the prompt. 8: Now, with the help of keyboard, enter the contact number and tap OK. It will take you back to the ‘Blacklist’ screen. Note: Make it sure to check the both the ‘Block incoming calls’ and ‘Block incoming messages’ to enable both. 9: At the ‘Blacklist’, see the number is added to the list. Now, if the message is sent from the listed contact, it will be blocked. 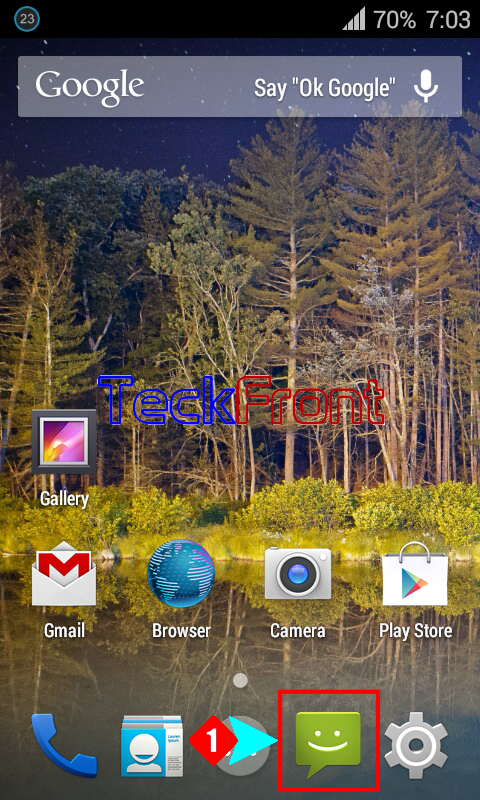 Newer How to Set Long Press Action for Home Button of Android 4.4.4 KitKat Phone? 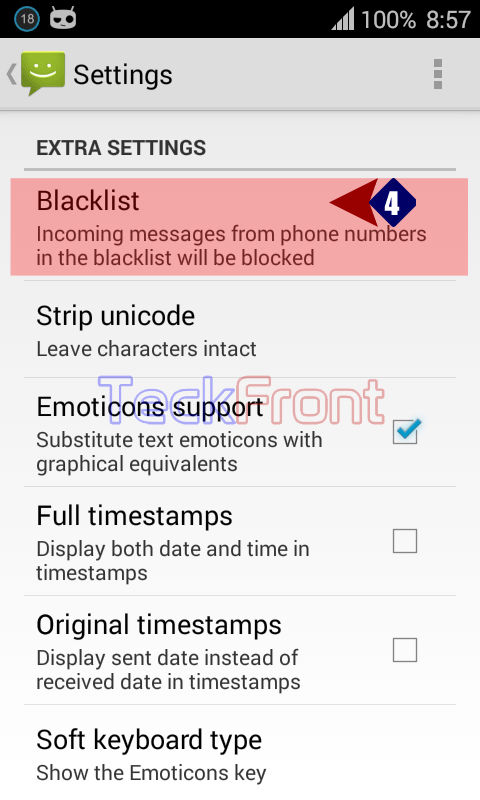 Older How to Activate Messages Blacklist in Android 4.4.4 KitKat Phone?